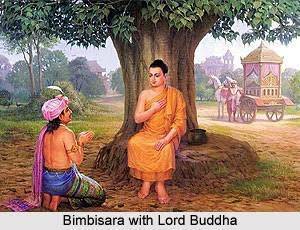 Holy, the Lord Buddha, who gave permission to King Bimbisara, King of Magadha Empire to prepare the ceremony to give foods to those who passed away. And this ceremony that we call San Dhounta as we are doing now. We are pleased and respectfully to invite gods to witness. They are male deity and goddess, the God Indra, god Brahma and the four Heavenly Kings are four gods on Cāturmahārājikakāyika, each of whom watches over one cardinal direction of the world. Dhṛtarāṣṭra or Thao Thatarot, watches over the east direction. Virūḍhaka or Thao Wirunhok watches over the south direction. Virūpākṣa or Thao Wirupak watches over the west direction. Vaiśravaṇa a (Kubera) or Thao Kuwen or Wetsawan or Wetsuwan watches over the north direction. 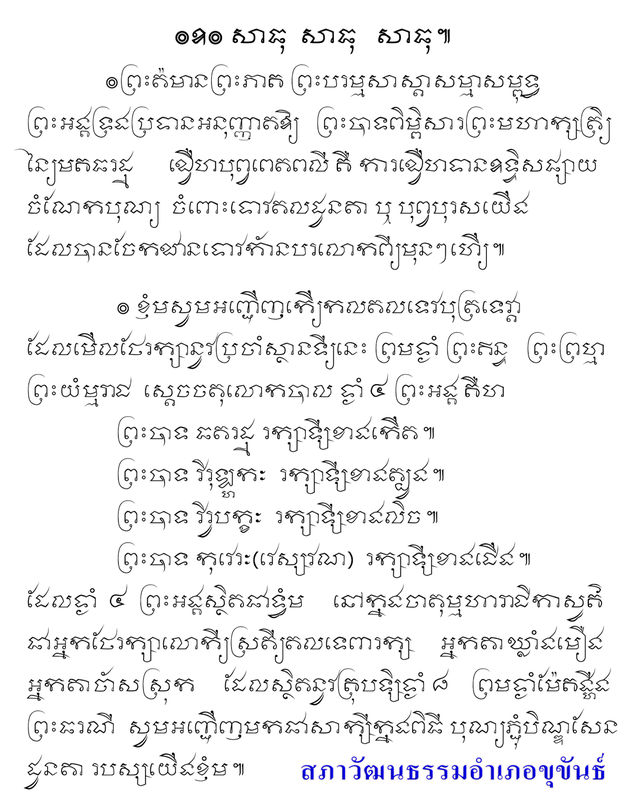 Also, we are pleased and respectfully to invite Guardian angels, treasurers, grandfathers, grandmothers of Meuang Khukhan in the eight directions also the Earth goddess to witness our San Dhounta ceremony nowadays. As of today, descendants of Meuang Khukhan are ready making merit in a big ceremony with every consumables to worship our grandfathers, grandmothers, fathers, mothers, brethrens, descendants those relatives who live everywhere to be happy with our offerings. 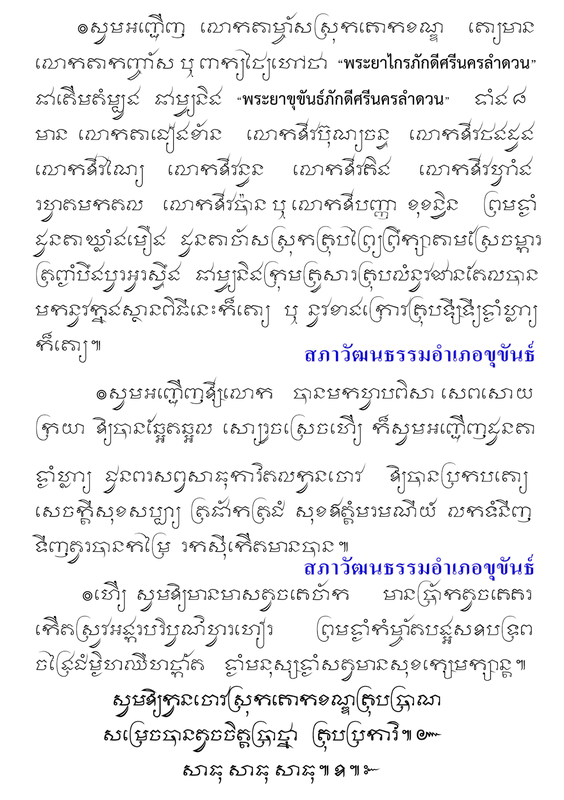 the mayor of Meuang Khukhan,the mayor of Si Sa-at, the 21 mayors of all communes, 22 commune headmen and 276 village headmen. Your descendants have already prepared every plentiful consumables on the tenth of lunar month to offer grandfathers and grandmothers to dedicate and devote merit to all relatives. We are happy to invite our grandfathers and grandmothers to receive consumables namely, desserts, various sweets, ripe many bananas, many kinds of mush, meat dishes and many candies, rices, fruits, taro, numerous eatable root crops, betel and betel nuts also incense stick and candle to worship our grandfathers and grandmothers to consume perfectly according to your wishes. Today, we respectfully invite all nine leaders of Meuang Khukhan to participate San Dhounta ceremony. 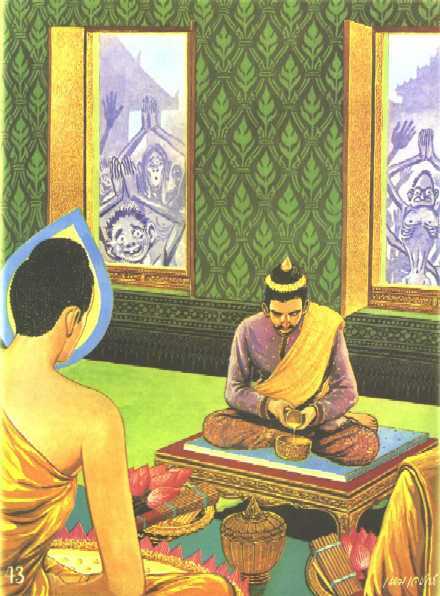 They are Praya Krai Pakdi Sinakorn Lamduan, as we always call him, Takaja, the first leader, Kunta Chiengkhan, Thao Boonchan, Kunta Thongdung, Kunta Thaonai, Kunta Thaonuan, Kunta Thao King, Kunta Thaowang also Kunta Pan or Kunta Panya Khukhandhin. In addition, we also invite all our grandparents, the treasury officer and other relatives who live everywhere, in forest hills, according to on the farm fields, creeks, lagoons, canals, swamps, to come and consume plenty of consumables. After all of you have had consumables happily, please bless us to be happy, to live long, to live in peace, to receive trading profit, to become wealthy, healthy, to have more plenty of fish and rice, to live without any illness and be happy both people and also animals. 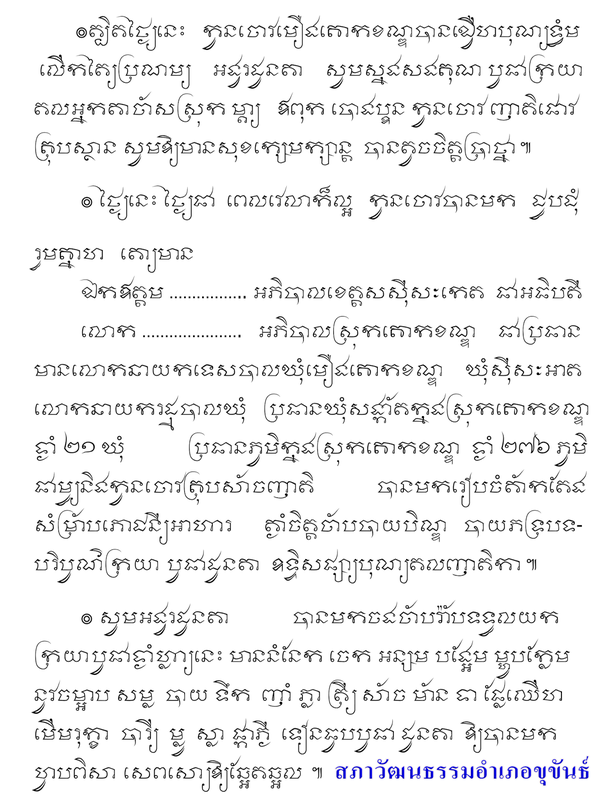 Everything what descendants of Meuang Khukhan are thinking should receive in all respects.